The Model Y is Tesla‘s second SUV, after the Model X. The vehicle will have a range of 300 miles per charge, the ability to accelerate from 0-60 mph in 3.5 seconds, and the capacity to seat seven people, CEO Elon Musk said. Tesla began allowing customers to reserve the vehicle for a $2,500 deposit after Thursday’s event. The three trims available to reserve start between $47,000 and $60,000. Musk said a standard-range trim would arrive in 2021 and start at $39,000. Tesla began allowing customers to reserve the vehicle for a $2,500 deposit after Thursday’s event. Three trims are available to reserve: a long-range, rear-wheel-drive trim that starts at $47,000; a long-range, all-wheel-drive trim that starts at $51,000; and an all-wheel-drive performance trim that starts at $60,000. The long-range, rear-wheel-drive trim has the longest projected range of the three, at 300 miles, while the other two trims have projected ranges of 280 miles. The performance trim will be the fastest of the three, with a top speed of 150 mph and the ability to accelerate from 0-60 mph in 3.5 seconds, Tesla says. Production for the three available trims is expected to begin at the end of 2020, Tesla says. Musk said during the event that a standard-range trim will arrive in 2021 and start at $39,000. During the unveiling event, Musk touted the Model Y’s performance, functionality, and safety. “It has the functionality of an SUV, but it will ride like a sports car,” Musk said. Musk said he expects the Model Y will become the safest mid-size SUV. 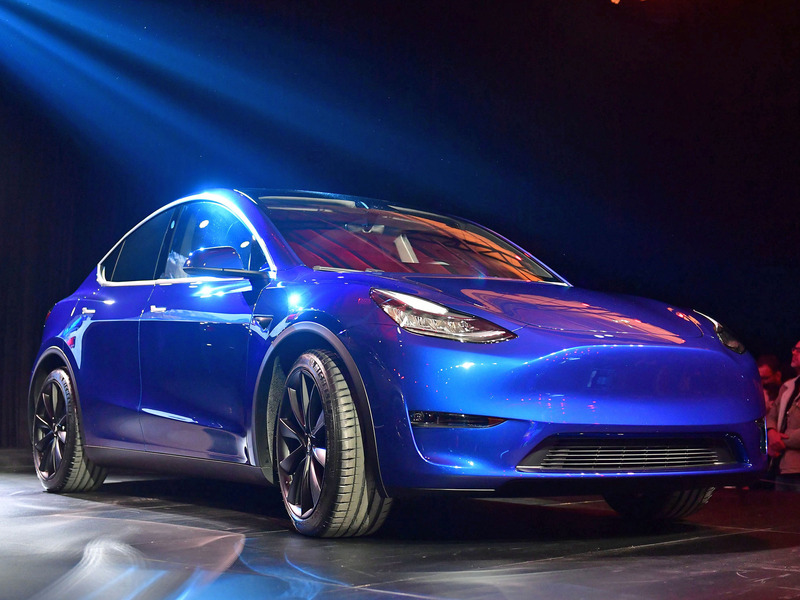 The Model Y’s unveiling comes at a time when Tesla is facing mounting financial pressure and, according to some analysts, a demand problem. In late February, Tesla announced it was closing most of its stores and moving to an online sales model. At the time, the company said the move would enable it to slash the prices for all of its cars by several percent and roll out the long-promised $35,000 Model 3 sooner than expected. About a week later, though, Tesla backtracked and said that it would actually keep more stores open and increase the price of its vehicles back to their previous amount. These moves signal the company may be facing some significant headwinds, according to Goldman Sachs analysts. “In the US, we think the amount of information points to declines in demand for Tesla’s higher priced vehicle variants following the start of the phase-out of the Federal Tax credit; and we believe moves by the company to continue to improve its cost structure in order to deliver lower priced vehicles and tap remaining consumer demand corroborate this,” Goldman Sachs said to clients in a note earlier this week. What’s more, Goldman analysts said there is also the worry that the reveal of the Model Y could put further pressure on the Model 3 sales because people may opt to wait to purchase the SUV instead of opting for the lower-cost sedan. Tesla’s in the 3rd version of ‘hell’ with its Model 3. And launching an SUV could make even things worse.